One of the greatest kitchen innovations in the past few decades has been the toaster oven. By combining elements of both a toaster and a microwave you end up with a device capable of quickly cooking smaller food items and save countless hours in the kitchen. However, it is not just enough to get a good toaster oven. When you make a purchase for your home kitchen it is important to buy a toaster oven that works well and lasts for at least as long as expected. One of the highest rated toaster ovens we researched comes from Panasonic. 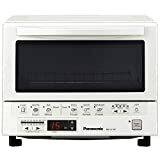 Panasonic is a household name when it comes to electronics, so it’s no surprise that they have such a highly-rated toaster oven. What Can You Make with a Toaster Oven? Toaster ovens are a kitchen appliance that combine the versatile usefulness and power of an oven with the portability of a toaster. While toaster ovens are weaker than a full-size oven, they make up for their smaller size by being able to concentrate heat into that smaller space, which results in the speed of cooking smaller objects. Practically, this technology makes sense because if you want to prepare a bread sized object, it’s much faster and more energy efficient to cook that small portion in a toaster oven rather than a more traditionally sized oven that can add heat to the room, as well as use more energy. A toaster oven is a small cooking appliance designed for counter-top use. Due to its size, the toaster oven is primarily used for the toasting and heating of smaller food objects. This device utilizes two main methods of cooking to get the job done. These methods involve a toaster component at the top of the device’s interior and an oven component at the bottom of the device’s interior. Toaster ovens utilize radiant heat for cooking similarly to how toasters cook food. Electrical energy is turned into heat by the device using wires and metal alloys. When you switch on your toaster oven, the metal coils begin to heat, and this creates infrared radiation inside of the device. Most toaster ovens will have metal coils on both the top and bottom of the oven for helping cook the food more evenly. Another feature which is common to the majority of toaster oven is timers. These devices use internal timers to tell the oven to shut down so that the food inside doesn’t get burned. Depending on the make or model of your toaster oven, there can be a variety of timers and cooking options built into the device. A setting for slow heat cooking to ensure that food is cooked evenly on both sides. A variety of defrost modes that help in getting frozen food cooked quicker without any bits still frozen. Certain models of toaster ovens will offer several tiers to help ensure different types of food will be cooked evenly. While ovens may lack an automatic timer, they can be programed for the number of minutes that are needed to cook the food. Depending on the model of stove, there may be multiple shelves that can be used for baking. Before you run out and buy a new toaster oven, it’s logical to ask why you need a new appliance for your kitchen. It is always important to think through benefits, negatives, positives, and other things like cost-effectiveness and budget before you make any kind of major purchase. One of the biggest selling points for purchasing a toaster oven is the sheer versatility that toaster ovens offer. This device combines the best elements of both a toaster and oven while having its own unique features. The bottom line is you end up with a device capable of paying for itself in the first month of owning because it saves you time, and that saves you money. Saving time during holidays by cooking side dishes while your full-sized oven is being used for the main dish. After you have finished cooking with the toaster oven, make sure to wipe down the grills after it has cooled down. Every week, make sure you empty the collection tray at the bottom of your toaster oven. After emptying the tray, make sure to wash the tray in warm soapy water and dry the tray before returning it to the bottom of your device. It is important to do a monthly deep cleaning to get rid of all the crumbs and built-up gunk in your toaster oven. This helps prevent potential fire hazard. It’s important to remember to remove any flammable objects from the vicinity of the toaster oven before turning it on. Make sure to read your toaster oven’s manual for a list of what kinds of food products cannot be used in it. Additionally, make sure to read food item labels to make sure you avoid placing anything in a toaster oven that shouldn’t go into it. Pay attention to the condition of the toaster ovens cables. Because it is a portable device it is easy for the cables to get frayed from use. A frayed cable is dangerous and must be replaced. We decided to look into the Panasonic NB-G110PW Flash Xpress to determine if it’s worth purchasing for your home or office kitchen. We looked through a number of reviews, learned a bit about the company who makes it, and looked into the various features available on this specific model from the well-known Panasonic brand. Panasonic is a Japanese electronics manufacturer who first opened their doors in 1955. They produce a variety of devices that include televisions, telephones, vacuum cleaners, microwaves ovens, digital cameras and, of course, toaster ovens. Originally, Panasonic as a brand was created in 1955 by Matsushita for American regions. The origin of the name Panasonic is derived from “Pan” meaning “all” and “sonic” meaning sound. The word sonic was used because the brand Panasonic was initially used for marketing audio equipment. Another notable footnote in the history of Panasonic is that they sold the very first bread machine. This Panasonic toaster oven can toast, brown, and bake up to 40 percent faster than other conventional toaster ovens, thanks to its specialized engineering. Because of its double-infrared power, the Panasonic toaster oven can outperform competitors fairly significantly, at least according to the manufacturers and reviewers. There’s no preheating required for the Panasonic toaster oven, so with the simple push of a button, it is instantly ready to heat thanks to the efficient two quartz and ceramic elements. Having these two elements means that your food will be prepared quickly and effectively while being cooked thoroughly. This toaster oven is designed with cook settings and controls that are simple to use and laid out in a logical manner. This model has six preset modes for calculating the perfect time and temperature for heating your food. For more precise control over the temperature, there’s a temperature sensor with manual control with eight different precision heat settings along with a smart digital timer. The oven’s simple and clean design is intended for it to fit into any kitchen countertop. Additionally, it includes a removable crumb tray, square inner tray, baking tray, and a bright interior light. Double infrared cooking lights with high-efficiency quartz and ceramic heating elements positioned to evenly cook. Cooks up to 40 percent times faster than other conventional toaster ovens. The toaster oven automatically calculates the cooking time for frozen food and reheating leftovers so there is no guess work required. Has a digital timer that allows you to set up to 25 minutes. The menu has size illustrated present buttons in order for ease of use. When the toaster oven finishes cooking, it has a reminder beep to let you know when the food is done. Has a button-controlled bright interior light. The oven’s drop-down door is easy to operate and is see-through in order for you to easily monitor your food as it cooks. Has an instant heat function that eliminates the need for preheating before cooking. The temperature settings range from 250 to 500 degrees Fahrenheit. While there is a lengthy list of cons listed, it is important to remember that these come from reviews where the users put the toaster oven through daily use for weeks on end. The Panasonic NB-G110PW Flash Xpress Toaster Oven is intended as a budget purchase for occasional use. If you are intending to put your toaster oven to heavy use, it would be better to invest a heavy-duty model that is a few hundred dollars more and get any extended warranties available to ensure it’s as long-lasting as possible. While there is no single toaster oven that can do absolutely everything, the Panasonic NB-G110PW Flash Xpress Toaster Oven is a great buy for what it can do. The quality of manufacture and materials, the positive reviews, and the various useful settings make this a great option in the budget-friendly category of toaster ovens. Before purchasing, always make sure you check out the prices at various locations both online and in stores, and check on any sales that might be happening in the near future. You’ll find the best deal that way. The Panasonic PAN-NB-G110PW toaster oven works great for food like toast, muffins, frozen food, reheating pizza and cookies! Thanks to its use of infrared light there is no preheating required for cooking. It also takes up only a small amount of counter space which I find very conventional. Thought it developed a lot problems while using it daily, it is only reasonable that its budget price is for occasional use only. All in all, I think this oven is a great buy for people who does not use it often.